Monarch Air Group provides private air charter in Qatar. Our clients benefit from top-notch service, unrelenting dedication to safety, wide selection of aircraft, and years of experience in chartering private jets. To obtain a free quote, please use our online quoting tool provided below, or call toll free 1-877-281-3051. Monarch Air Group provides private jet charter flights in and out of Qatar. Qatar is a sovereign Arab state, situated in Western Asia, occupying a peninsula on the west coast of the Persian Gulf. Doha is the capital of Qatar. The climate is characterized by a hot summer and a mild winter. 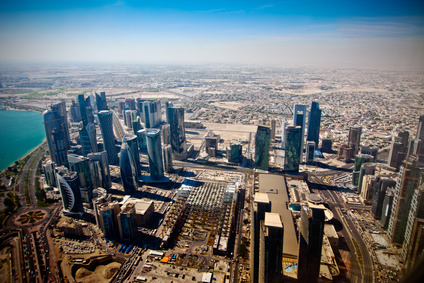 Qatar has the highest reserves of oil and natural gas and the world’s highest GDP per capita. For centuries, Qatar’s economic activity has been centered on pearl diving, fishing and camel breeding. Today its national income primarily derives from oil and natural gas exports. Popular art forms in Qatar are pottery, printing, sculpting, jewelry making, lace-making, calligraphy, painting drawing, and photography. The most notable tourist attractions are Museum of Islamic Art, Al Markhiya Art Gallery, Al Bida park, Al Koot Fort, Al Shaqab Stud Farm, Al Zubara Fort, Doha Zoo, Khor Al Adaid, and much more. The Doha International Airport is the main airport of Qatar. 1. DOH, Doha, Doha, Qatar. 2. XJD, Al Udeid AB, Al Udeid, Qatar. 3. XOZ, Doha Free Zone, Doha, Qatar.